I watched a documentary about the Toynbee Tile phenomenon, Resurrect Dead: The Mystery of the Toynbee Tiles, a couple nights ago. 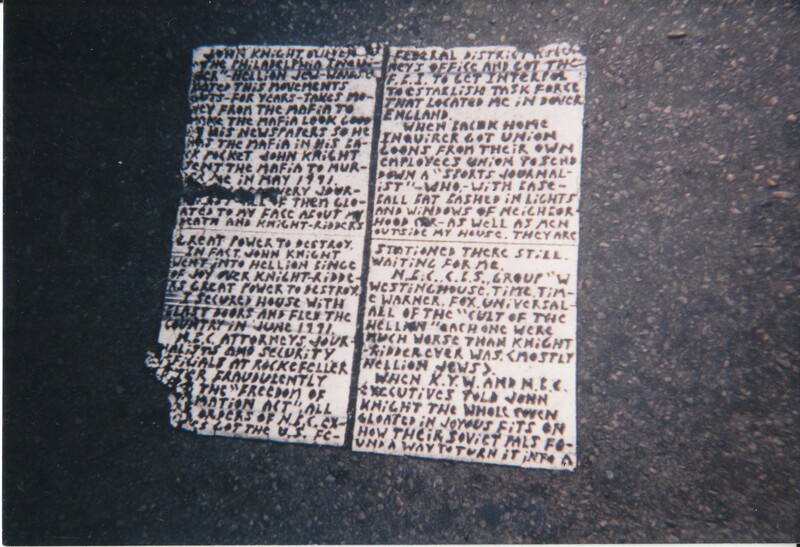 As the filmmakers' case began to take shape, and in particular the timeline they compiled of the Tiler's many efforts over the years to broadcast (literally, in the case of alleged shortwave and television jamming) Toynbee's idea of resurrecting the dead on Jupiter, I was struck yet again by the most mysterious aspect of the Toynbee Tiles. Obviously the Tiler is paranoid, maybe even schizophrenic. One only need to look to the four-tile screed the Tiler left on Chestnut street in Philadelphia to confirm the tiles clearly came out of a troubled mind. The insistence of the tile text, though, and in particular the side text. The first tile I ever saw in person was in Chicago, near the Hancock building. It had the usual title, "TOYNBEE IDEA IN KUBRICK'S 2001 RESURRECT DEAD ON PLANET JUPITER," but what interested me the most was the side text, below the tile. It said, "YOU MUST MAKE + GLUE TILES" over and over again (another tile, in Saint Louis, also featured this refrain, and I photographed it). The whole timeline, from the call in to the Larry King show, to the television jamming, to the shortwave radio station, to the proliferation of tiles, indicates a man who felt genuinely, deep down, that he had conceived of an idea that could save Humanity. He obviously felt it was urgent enough to try actively to spread his idea and to have it considered by people of great importance, yet eventually resorted only to leaving linoleum tiles embedded in asphalt all over the world, with instructions for other Toynbee enthusiasts to do the same. When the tile enthusiasts in Resurrect Dead were at his doorstep attempting to contact him, people who were uniquely sympathetic and who would listen to whatever ideas or notions he had, he refused to answer the door. He had an idea that was so vitally important to him that he would go through so much effort to spread it, yet he ultimately just wanted to be left alone and didn't want to be found. I know, when I think about it rationally, that I only feel stung by this because I, too, am a devotee and utterly fascinated by the tiles, and I wanted to finally know the answer. The difficult lesson here is that some mysteries, even those as tantalizing as they are intriguing, simply do not want to be solved. On to the next one, then, space cadets.